Check out the new Flash animation! So I’ve taught at various audio recording schools for a while now—teaching both online audio recording classes and at “real” colleges. I have both an undergraduate and a graduate degree in recording and audio technology. The point is, I’ve been walking the halls of audio recording schools as a student or teacher for going on a decade. I remember sitting for my orientation when I went to get my undergrad audio degree. I had my little “Desktop Digital Audio” book I’d picked up at a bookstore (you know, when they still had bookstores). I had absolutely no idea about anything that was in it, mind you, but at least I looked like I was trying. Unfortunately, just buying that book was probably more effort than any other beginning students in the room had thought to put forth. And that brings me the 4 big problems I’ve seen with many students who attend audio recording schools. Watch out for these! 1) Students don’t know what they’re getting themselves into. Hint: the students who learn a bit about Protools/Reason/Logic/etc, microphones, effects, and mixers before they start school, generally end up doing better. Now, I think there are several reasons for this. One is that if you’ve tried to learn it on your own, or you took an audio production course before you hit school, it shows the independent work ethic and self-motivation that you must have to be successful at this (or anything else for that matter). Also, instead of stumbling around in the school studio (once you finally get there), you can actually use it. You can make good recordings, impress people, build a portfolio, and work on setting yourself up to succeed when you graduate. By the time many students finally start understanding how to use the gear, it’s time for them to leave. The point is, so many students don’t prepare before they get to school, and even when they get there, they don’t think much about audio outside of class. These people are pretty much screwed. In reality, they’d be screwed no matter what field they chose. That leads me to my second issue. 3) Don’t be in a rush to “get in and get out” of school. Let me repeat: unless you have a job waiting for you in the outside world, don’t be in such a hurry to get out of school. I’ve seen this countless times. Students just can’t wait to graduate. They don’t take all classes that might benefit them—they don’t focus on how school can benefit them. They focus on the degree—the piece of paper they’re going to get at the end. Then they cry about having to work at McDonalds when they graduate. Listen, it’s going to be hard enough even if you play your cards right. So, use your time at school wisely. Learn as much as you can, and meet as many people as you can. There may never be another time in your life when you can devote so much of your attention to filling up your brain and learning from people who actually want to teach you. As a student, your opportunities to network are almost limitless. People generally don’t mind helping out students. Join every organization that interests you (and even some that don’t), and then actually go to their events and meetings. Joining AES (the Audio Engineering Society) is more than just having something to put on a resume. Go to their meetings—regional, national, and international—and meet people. Your meeting future colleagues and employers. 4) Lastly, take charge of your own education. If you are waiting for someone to teach you everything you need to know, you are in trouble. Instructors are a great resource, but don’t become dependent upon them to spoon feed you. You’ll be out of school before you know it, so you’d better start learning how to teach yourself. Your teachers are there to stimulate your mind—expose you to topics, techniques, and practical application. It’s up to you from there. Get on forums, read magazines, get a good internship. There is more to know than could be taught in 30 years worth of schooling. Ultimately, you are in charge of how much you learn, and how successful you are. The status quo (getting all “A’s” and showing up to class) isn’t enough. Are you trying to get work as an engineer outside of class? Are you reading on your own and asking questions? Now is the time to start, not once you graduate! I’m sure I’ll think of additions to this list in the coming weeks. Understand that I’m not complaining, or being overly critical of students. I just want them (and you) to succeed. What I don’t want is for you to regret going to school, once those loan payments kick in. An education in audio can be very rewarding and fun, but it is not a decision that should be taken lightly. 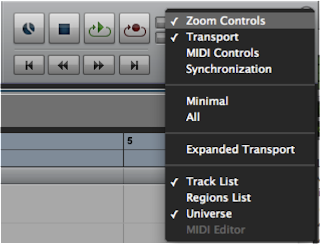 Protools users are used to the transport embedded at the top right of the Edit window. It’s a “stripped down” form of the floating transport window (found under the Window>Transport menu). In Protools 8, this “always visible” transport in the Edit window can be customized to show a variety of useful parameters by click the little triangle to the right of the record button. In fact, you can customize several parts of Edit window from here. Not only can you show MIDI Controls (Metronome, Wait For Note, Countoff, etc), but you can also now show the Regions List, the Universe, and the Track List. You may never have to deal with the floating transport again! Come by The Online Audio School for free, live classes on a variety of audio programs and techniques–Protools, Reason, Logic, Ableton, mixing, how to use synthesizers and samplers, etc.